Usually, the idea of art recalls images of grand, undecipherable paintings hung in lofty galleries, being admired by a motley group of elegant elites in high heels and pince-nez. Or unkempt writers penning beautiful words at a wooden desk in a lonely beach house. Whatever the image may be that is conjured up by your mind at the mention of art, one thing remains pretty common: it is not something we associate with the daily grind of existence. It is something far away from the daily chores and slogging, something to be enjoyed only in leisure, and perhaps never completely understood. But it does not have to be that way. If you think about it, art is in fact pretty much part and parcel of our lives, and has a bigger influence on us than we realize. 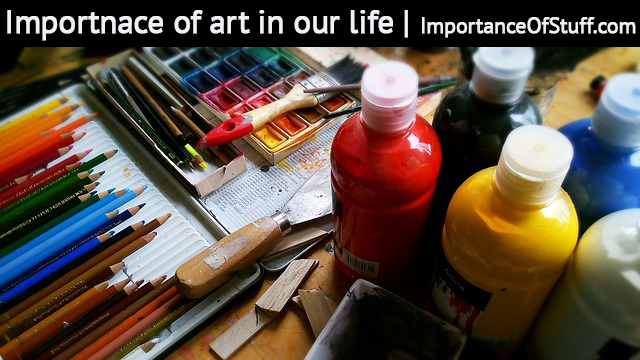 In this article, let us see the different ways in which art impacts us every day. Art, in its many forms, is something that we usually indulge in at our leisure. Each of us have our own choice of art that we enjoy- some of us might like to read, some paint, while others watch movies. Each of these is a separate form of art in its own right, and they all provide the much needed respite from our daily hectic lives. While we are enjoying a piece of art- whether by actively creating the art or appreciating an existing creation- we are transported away from our daily grind for the time being, which in turn energizes us and leaves us more capable of handling life after the intermission. All art brings peace and tranquility in its own way. Now a lover of folk music might find only cacophony and discord in death metal, and a chick lit fan will cringe at the melancholy in Kurosowa’s movies. But each of these caters to a particular audience, and for that niche set, it brings peace. For some people, peace is in getting to escape from daily life for some time, while for some others, it’s in knowing that there are others sharing their trials and tribulations. On the other side of the table, art is often an expression of pent up emotions, which bring peace in the wake of their release. Art is not just something the artist creates to showcase their talents. More often than not, art begins to take form when there is a need for expression of thoughts and emotions that cannot be expressed otherwise. It is said that all art is a confession, and it is true to an extent. The subject matter of all art stems out of unexpressed ambitions, anger, joy, love, or frustration. And this has broader implications too; psychologists across the world probe the journals and artworks of their patients to get a glimpse into their psyche. It is not easy to live with bottled up feelings that find no outlet. Art provides that outlet to us. When we write a journal at the end of the day, we pour our hearts out in that piece of paper. When we carve a piece of wood or strum on our guitar, every stroke expresses something we are feeling at the moment. It helps us become calmer, not just in the moment, but in general as well. Knowing that we can let our feelings out at the end of the day keeps us grounded in moments of stress. Art is engaging, and helps us keep our minds off the darkness that often envelops us in our daily lives. Rehabilitation centers are a good example; they encourage the members to take up an artistic hobby in order to keep their mind off their poison of choice. Research suggests that an artistic person is better attuned to the world around them in general, irrespective of what movies tend to show. An artistic person is generally more sensitive and sympathetic, and is in turn a better team player and better human being in general. They are more attentive to detail, and can look at a situation from all angles. This is because good art is composed of fine details, and they are used to looking at things minutely. Their creativity also makes them out of the box thinkers, and all these abilities combined make them highly efficient in the workplace. Art is something that we encounter at every step in our lives. The graffiti that you see on the walls is a form of art, as is the beautiful building around the corner, or the intricate carving of the showpiece you bought on your visit abroad. Each of these things have an impact on us on a level so intrinsic we cannot notice, but combined together, their presence and appreciation is what shapes our lives.